I will add one important note. 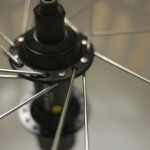 Building a wheel is not impossible, but it is far from easy. It takes patience and an attention to detail. The attention to detail starts when buying the parts. 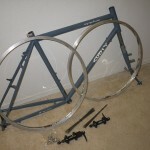 I would have saved myself a lot of hassle if I had started getting my parts earlier – but since I only had one week to get my parts together, I couldn’t order online and had to rely on local bike shops. I mis-matched my hub and rims (they were each made for a different number of spokes), after I replaced my rims I discovered that the bike shop accidentally gave me the wrong size of rim (27 inch instead of 26 inch) and finally I discovered the hole for the inner-tube air valve was the wrong size (there are two types of bicycle inner tubes, presta have thin valves made just for bikes, and schraeder which are normal car-size air valves). 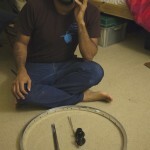 The patience comes in once one starts to build the wheel, the best way is to go slowly and methodically. 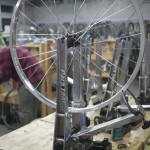 As I discovered the hard way, you don’t necessarily notice big mistakes early on – it is possible to get 75% of the way through building the wheel without even noticing mistakes made with threading the first few spokes. 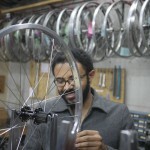 I almost finished one wheel, but noticed the tension on the spokes was majorly unbalanced – the mechanics at the shop suggested de-tensioning ALL the spokes and starting over again. It took me 6 hours to build my first wheel, but only 3 hours to build my second wheel. 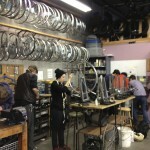 The workshop leader said it took her about 45 minutes to build an average wheel, after years of practice. I’m so happy I decided to build my own wheels. 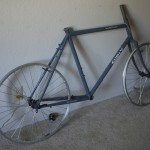 I can’t wait to get out on the road and know that I really built up almost every part of this bike.